Last month millions of us celebrated the Easter weekend, complete with the giving and receiving of eggs, as UK consumers bought £374m of chocolate. The month before that, statistics indicated that 25% of low-income households in the UK struggle to eat regularly or healthily, which is supported by the increased use of foodbanks. It’s time to talk about our food consumption, as individuals and as communities. The first substantial survey into the scale of food insecurity in the UK showed that food insecurity is most concentrated among the unemployed; that four million adults frequently struggle to put food on the table; and that 17% of adults worry about food supplies running out before they have the money to buy more. Although the Scottish government has agreed to implement a food insecurity measure, campaigners and MPs have had their requests to monitor food insecurity regularly rejected by the UK government. Fortunately, there are some brilliant community projects working to alleviate food insecurity as well as raise public awareness of the problem. We’ve been speaking to Peter Lefort (Oxford Food Surplus Café), Gary May (No Walls Gardens), and Vera Zakharov (Love Food Hate Waste) to find out about food insecurity, why its a problem, and what we can do to help. What does ‘food insecurity’ actually mean, and is it really a widespread concern? Peter: To be food insecure means that your access to healthy food is not reliable. It might be for financial reasons, or that it's hard to get nutritional food nearby, or that you were simply never taught how to cook. Whatever the cause, it can affect everyone, and while those on the lowest incomes are most susceptible it can be an invisible issue across a wide cross-section of society. Vera: The rapid expansion and proliferation of food banks across the country points to a growing and continuing food insecurity crisis. What’s causing food insecurity, and why are the most vulnerable people in society the hardest hit? Gary: The causes and contributing factors of food insecurity are complex. It is not – necessarily – a lack of education or understanding; but often a lack of easily available alternatives. Peter: There's a perfect storm of factors: an increase of the amount of nutritionally poor food (it's getting cheaper, it dominates most supermarkets), growing inequality (salaries, housing) and a constant barrage of confusion about what makes food 'good' (wonky veg seems bad, fast food is everywhere) to name just three. Another factor is that food is often the thing which people make sacrifices in. If you don't pay your rent, if you don't pay your heating bill, someone will know, and you can be turned into a criminal. If you don't spend enough money on food, then no-one else can tell. And as soon as food becomes a fear, that feeding yourself and your family is a source of anxiety, things can spiral down quickly. Vera: I hope that the future of food in the UK will involve a concerted effort to tackle the root causes of financial insecurity, which is a precursor to food insecurity, rather than more short term sticking plasters. I expect that food prices will rise, as a consequence of improved worker, animal and environmental welfare standards and of Brexit, and expect to see a more concerted effort to ease the burden this will have on the poorest in our society. This will hopefully be mainly through fixing the housing crisis and creating more jobs. But I’m an optimist! Gary: I would like to believe that the future of food is an enhanced, modernised, version of the past. Smaller, local producers utilising enhanced productivity growing methods (such as aeroponics or aquaponics) to produce food crops in energy, water, and space efficient urban farms. Alternatively, projects such as Thanet Earth show what can be done when farmland is converted to a more modernised industry. I think that over the years, people have become used to the supermarkets being full of every crop, all year round. Pandora's box is open. However, society as a whole needs to recognise the many benefits of locally grown produce, and for people to adopt a diet which focuses on quality rather than convenience. Peter: Just as importantly, we need higher wages and more job opportunities. It's all part of the same system. 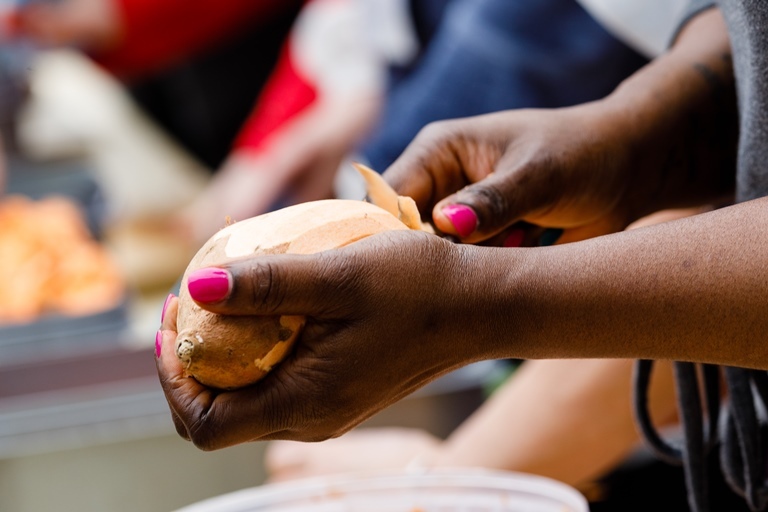 What can local communities do to engage with and, ultimately, alleviate food insecurity? Peter: Locally we can support suppliers which benefit our own communities - create and sustain the demand which will keep the supply coming! Globally, there's enough food to go around, but two big barriers are distribution and waste. So wouldn't it be great if we could share our food whenever we can? Vera: I think connection is the biggest tool in the hands of individuals and communities. People certainly can and should get involved in voluntary activities that address the short term needs of people in crisis. But it is equally as important to create spaces and opportunities for communities to connect, as stronger networks mean better individual resilience when facing financial and life challenges. Likewise, it is important for communities and organisations to unite to jointly call for changes both in the private and public sector, with a view to changing food policies, as well as housing and benefits policies. I believe both actions are needed in tandem – supporting ourselves locally and challenging systems that are broken nationally. What can individuals do, in their everyday lives, to make a difference? Peter: Be aware of what your money is doing, and which systems it is holding up. But most importantly, talk to people! Sharing stories about the realities of food with friends or strangers can allow the shame associated with hunger to start to be replaced with the confidence that it can be overcome. Vera: People should stay civically engaged to make sure food insecurity is on the agenda of their elected representatives. And if people are in a financial position to do so, they should make purchasing decisions that lead to better financial security of people in the food and hospitality sector, some of whom are most at risk of food insecurity. Gary: No Walls Gardens are also encouraging individuals to grow crops in their gardens or window boxes either for their own use or to be shared with the community. Donate to your local foodbank – or volunteer at any of the numerous local projects that are trying to address the huge inequalities in our society. Often, I think people don't realise how the skills that they have can be of benefit to the small grassroots organisations like ours. And finally, just get involved – this isn't a problem that will go away on its own. Make a banner. Take a stand. We are living in the future – and it's inconceivable that here, in the 21st Century, in the fifth richest country on Earth there are families going hungry just to survive. Peter was horrified to learn that we throw away over 1.3million bananas each day, and so he and his colleagues started a community kitchen project in Oxford called Dinner Time: by collecting food that would otherwise be wasted and inviting people to come to a local community centre to cook and eat the food together, Dinner Time fed individuals as well as community spirit. Dinner Time has evolved into the Oxford Food Surplus Café, which aims to help redress the imbalance in our food system by reclaiming surplus food and transforming it into delicious healthy meals for all – whilst encouraging community engagement. Gary’s community interest company, based in Northfleet, started in 2013. No Walls Gardens works with those furthest from the labour market – the unemployed, ex-offenders, people with substance abuse and those with health issues. Through community gardening and food growing initiatives, they are able to provide a rolling training programme which develops soft skills whilst keeping the focus on participant wellbeing. Gary has recently secured funds to start Northfleet’s Incredible Edible – a global network of community groups growing and learning together, with a focus on food activism. As a part of the Food Partnership, Vera is well placed to offer information, inspiration, and ideas around food and community. 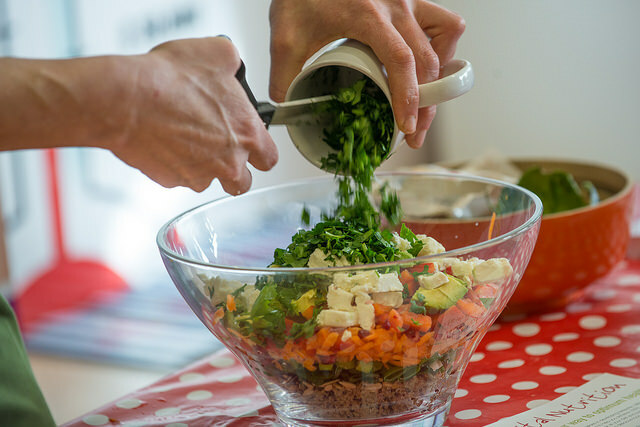 Vera works in partnership with her local council and other community organisations to deliver a public education campaign on reducing household and consumer waste through training sessions and recipe demonstrations. She also works alongside her local network of food surplus projects. Vera recently attended a Community Camp at The Eden Project in Cornwall to boost her community work, where she took part in focused workshops, structured activities, and network events with community-minded individuals. This isn't a problem that will go away on its own. Make a banner. Take a stand. It's inconceivable that here, in the 21st Century, in the fifth richest country on Earth there are families going hungry just to survive.